The week before you go away always feels like you’re stuck in a time warp. Are you counting the days until take off? Did you book your bikini wax at the right time? Why can’t you find the perfect swimsuit? The questions are endless… as if you haven’t got enough to think about right now! The worst part of packing? The niggly bits like hair clips, safety pins and plasters. You know, those everyday essentials that you tend to forget to take. Well, all hail Emma Lomax! She’s packed everything for us, and in the cutest travel-friendly case, too. Every eventuality is covered, with fragrant deodorising wipes for a hot and sweaty journey to a hand sanitizing wipe for those icky mishaps. Honestly, the SOS kit makes travelling so much easier! We all know plane travel is detrimental to the moisture levels in our skin. With Embryolisse, it is possible to look like you’ve just stepped off a runway – literally! Believe me when I say, it just works. It’s completely multipurpose, which is what holiday packing is all about. Steal a tissue from the cabin crew and use as a cleanser to remove any makeup, then reapply as a mask and sit back and relax for the duration of your flight. Its intensive surge of moisture is perfect for everyone (even for your other half when he shaves on your getaway), plus you can keep it as a daily SOS treatment for every day of your holiday – win! Weighing up the cost of buying a new fragrance and thinking ‘but what if it smashes in the suitcase’ always gets me when I go away. Apart from great smelling clothes, there’s nothing fabulous about being fragrance-less for your holiday. If you have a fragrance you know and love, I highly suggest that you grab a Travalo! Shatterproof, re-fillable and under 100ml, you can carry your signature scent everywhere with you. Mini refresh at the pool bar, anyone? Top Tip: If you’re a nervous flyer, lemon leaf and ho leaf essential oils can help to calm your nerves. 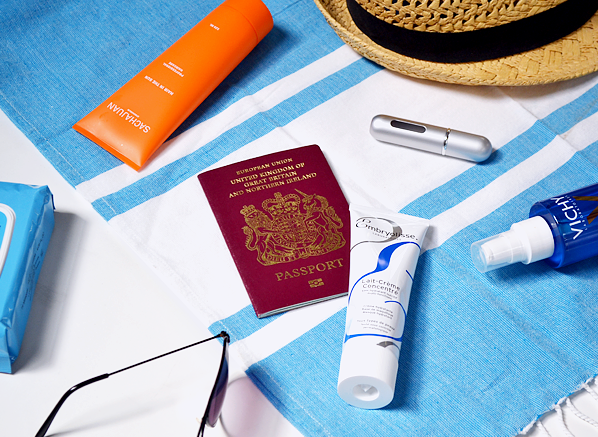 Roll on the Travel Aromatherapy Roller Ball from the Tisserand Travel Duo Kit 30 minutes before the flight and re-apply when necessary! The infamous ‘shower sting’ is something that we all dread when away, right? 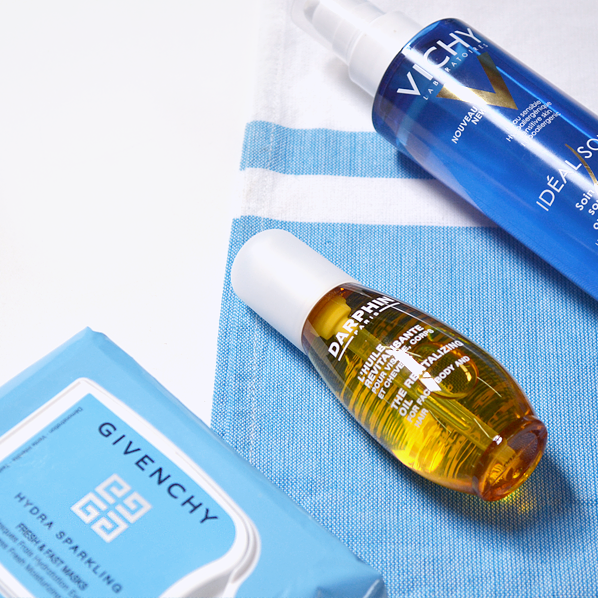 What’s great about the Vichy Ideal Soleil After Sun is that it eases the uncomfortable tightness from burnt skin, whilst keeping your skin feeling soft for a total of 48 hours. Whether used in the shower or on dry skin, its fatty acid-rich formula is a soothing must-have when you’ve been overzealous with the sun exposure. I store mine in the fridge for added coolness, as I tend to go a brighter shade of red over brown – ouch! A peeling nose never a good look. In the warmer weather, it’s a given that your skin is going to become more parched, so why not treat your thirsty skin to an intensive surge of hydration with the Givenchy Hydra Sparkling Fresh & Fast Masks? They’re so fun to apply, and the results are well worth looking like a Halloween character for 20 minutes or so. The travel-friendly pack dispenses each saturated sheet mask like a wet wipe, meaning they’re always ready to go! Another magic trick is the Darphin The Revitalizing Oil. Hair, face, body… you name it, this oil can be used everywhere and anywhere. It’s packed full of pampering oils to relieve your body of dryness whilst embellishing your skin with a supermodel sheen, plus it has the most gorgeous solar floral scent. This oil is my sunshine holiday go-to. For me, a sunny holiday normally results in a snapped fringe and frizzy ends. If you can relate, then you need the Sachajuan Hair In The Sun cream! This lightweight cream shields and protects your hair from sun damage and UV rays, even after you’ve showered the sand away. As a bonus, you can even use this super-light cream as a styling aid… surf style plaits and messy buns are yours! La Roche-Posay just get sun care right. Known as sunscreen with a ‘texture that you actually want to wear’, the Ultra Light Spray is easy to use and absorbs quickly – there’s no awkward t-shirt tan with this SPF. 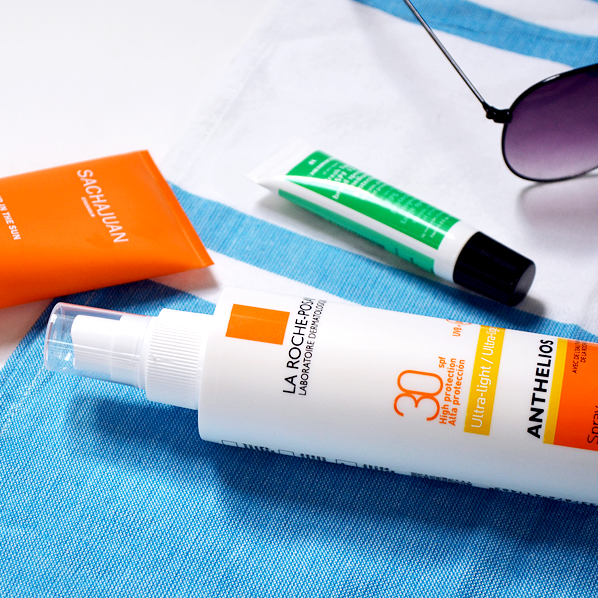 Anthelios contains protection against both UVA and UVB rays, helping to prevent pre-mature ageing and sunburn – yas! As if dry, cracked lips weren’t enough during winter, we need to protect this delicate area even more when we hit the sunshine and sand. Fresh Lips from Ole Henriksen is no ordinary balm, though. It steps up to the plate with a wealth of hydrating ingredients, a touch of salicylic acid to keep things smooth, and SPF15 protection. Your lips will be looking kissable from sun up to sun down! Top Tip: Take a spot of body powder to the beach, it works a treat to remove sand from your skin! We love the Crabtree & Evelyn Summer Hill Talc-Free Body Powder. This entry was posted on Monday, June 20th, 2016 at 3:31 pm and is filed under Bath & Shower, French Pharmacy, Haircare, Hints & Tips, Skincare. You can follow any responses to this entry through the RSS 2.0 feed. You can skip to the end and leave a response. Pinging is currently not allowed.